The installation in the form of ten banners sheds light on the history of the coffee trade, provides background on the global coffee industry and provides information on fair trade. Fair trade is a way of trading that gives people from Africa, Asia and South America the chance to subsist from their own work under decent working conditions. The Fair Trade Certification is for small farmers who organize themselves into collectives. Fair trade gives agricultural labourers a pre-defined price for the coffee they produce and it also provides them with a bonus to invest in the development of their community. Furthermore, child labour is strictly prohibited. The installation is located in the Museum of Gastronomy in Prague in a separate room between an exhibition about small local shops and traditional restaurants. 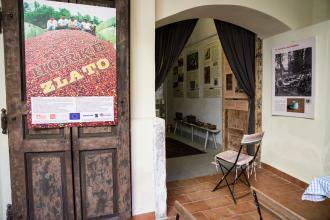 The installation consists of ten banners, which provide information on the history of coffee and its preparation. In addition, the installation discusses the situation of small coffee growers and the problems facing the global coffee trade. A long time ago, coffee was only used in monasteries. In the 17th century it started to spread throughout Europe, where it became very popular even though it was described as the “bitter and dark drink of Satan”. After a few centuries, the coffee trade became more significant and large amounts of coffee were traded. In order to stabilize prices, regulate trade through the use of quotas and support coffee-exporting countries, an international agreement was signed by the coffee-producing countries. In 1989, this agreement fell apart and there were no regulations for a few years, which led to a huge decline in coffee prices. In 1994, another agreement was signed, but it no longer aimed to regulate prices. Therefore, many producers of low-quality coffee appeared and transnational corporations beat down the prices, resulting in prices falling to under 50 cents per pound of coffee. Most coffee is grown in isolated areas by people without access to information and education, and that makes them vulnerable to exploitative conditions. Visitors are informed about fair trade, which is trying to find solutions to all the challenges faced by producers. It is a way of trading that provides people from Africa, Asia and South America the chance to subsist from their own work under decent working conditions. Fair Trade Certification is for small farmers who organize themselves into collectives. Fair trade gives farmers a pre-defined price for the coffee they produce and it also gives them a bonus to invest in the development of their community. Furthermore, child labour is strictly prohibited. The final element of the installation is a display of historical and recent artefacts, which are connected to the preparation and consumption of coffee. There is also a photo commemorating a coffee meeting organized by the first Czech president. The installation is installed in the Museum of Gastronomy in Prague in a separate room between an exhibition about small local shops and traditional restaurants. In order to present alternative ways of trading, we wanted to have an installation on the topic of fair trade. We contacted different museums like the Museum of Chocolate and Coffee, but in the end we decided to install it at the Museum of Gastronomy in Prague, which was very open to cooperating on the project. This process took us two months. The installation was prepared in cooperation with Educon, the Association for Fair Trade in the Czech Republic, and the Museum of Gastronomy. We prepared the texts and the background. The NGO NaZemi gave us authentic photos showing coffee production in fair trade cooperatives. We interviewed people who had visited the local communities that were cooperating with the Czech fair trade organization. The “bitter gold” tool is part of a wider exhibition about coffee. This was also one of the reasons why the museum was eager to host the tool. This process took about two months. 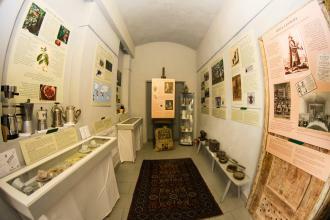 The Museum of Gastronomy prepared the graphic design, and authorized the printing and the final installation on-site. This process took two weeks. The installation fits in very well with the permanent exhibition and, therefore, it is possible that it will be retained as part of the museum’s permanent exhibition. 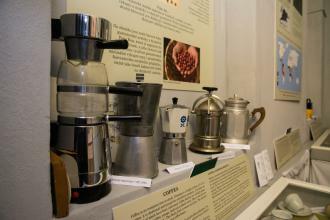 Thanks to the installation, the museum’s shop started selling fair trade products, especially coffee.